GTEN.org is a member-based website. We invite you to become a member. GTEN.org members learn the methods, principles, trust structures and operating tools for profound transformation of the ways in which they operate, both individually and for the collective good. By functioning effectively in well-crafted private express trusts, empowered with conscious creation and unalienable rights, and secure in the only truly private form of organization for asset protection, our members create a legacy of freedom and opportunity. We're glad you found us. Welcome to our world. GTEN is a private not-for-profit trust organization comprised of a network of individuals serving the common good through trusteeship of private and charitable trusts organized for educational, literary, scientific and spiritual purposes, to lessen the burden of governments, to defend and promote rights and freedom, and to actively assist in the sound, sustainable, enlightened evolution of mankind for a world that works for all life. The collective expertise of the network of individuals comprising the Global Trust Education Network is shared with GTEN.org members through online webinars, selected reading materials and trust formation documents. For more information, please explore the content behind the buttons to the right. Gearing up for our next GTEN course. The Art of Business: Mastery of Sales, Negotiation & Conflict Resolution begins in January. Here are the details. The Art of Business uncovers, demystifies and explains the core practices that assure business competence and success. Whatever your profession—employee, salesman, executive, business owner, entrepreneur, attorney, mom, dad, you name it—this course is for you. What makes some people highly successful, while others can’t seem to catch a break? In most cases, there’s one simple reason for the difference. Highly successful people, whether they are aware of it or not, practice certain core principles and skills that less successful people don’t. So why doesn’t everyone just do that? Most people have never been told, never learned, never understood, and therefore never practiced the core skills of good business. We're pleased to announce the creation of a new course for GTEN.org, Commercial Credit Fast-Track. We've already begun creating the course. Access for registered participants will open on the forum in late fall, 2015. Register now for the best value, as the donation levels will rise throughout the summer until we reach the full donation amount at launch." We've recently learned that one of our own GTEN family has been diagnosed with stage 4 cancer at age 48. His doctors give him 6 months without treatment or 2 years with chemotherapy. That's not acceptable, and it's incorrect, given there are an estimated 400+ known naturopathic cancer treatments, many of which work better than chemo, and we're confident that some combination of them will effectively treat and eliminate the disease. We're all one degree of separation, at most, from somebody with cancer. We can no longer afford the dogma of the AMA, bought and paid for by the pharmaceutical industry. It's time we get the facts straight for everyone's benefit. The Ferguson tragedy, the deaths of Mike Brown, Tamir Rice and Eric Garner, the indictment of 18 Los Angeles County Sheriff’s deputies by the FBI for excessive force, the resignation of L.A. Sheriff LeRoy Baca in the wake of countless police brutality charges, the imprisonment of L.A. Sheriff’s deputies for interfering with police brutality case witnesses… Incidents of excessive force and cover-up lead today's news stories nationwide. Too often, the offenders go untried and unpunished due to a lack of financial resources for victims to pursue just retribution in court. But this may be changing, thanks to a new crowdfunding campaign. The Global Trust Education Network (GTEN), an organization that teaches natural rights, freedom and trusts, has begun to help victims of police brutality fight their cases in court and help establish economic and racial justice. The Trustees of GTEN have created a private trust fund to assist victims in bringing their excessive force cases to trial, and they are crowdfunding the trust fund through Indiegogo with a campaign called Bad Cop No Donut (http://igg.me/at/badcop). Do you have an idea for a charity or need to set up a trust? The Global Trust Education Network (GTEN), an educator of private individuals, trustees and directors of not-for-profit organizations, announced this week the public launch of the GTEN Forum, a free online community resource to discuss topics such as natural law, organic laws, rights, freedom, commerce, contracts, trusts, asset protection, non-profits, consciousness and conscious creation. The new GTEN Forum is free online at GTEN.org/forum. The goal of GTEN.org is to provide both the know-how and the network for the awake and aware to accomplish meaningful change. The next live GTEN webinar series is scheduled for January: Administrative Justice, the Power of Contractual Due Process. Sign up now to reserve a spot at the lowest cost. Establish disputed facts privately by administrative process, disqualify debt collectors, void a driver's license or other contract ab initio, void traffic tickets, eliminate court appearances, obtain private adjudication of any controversy, and enforce any agreement. Click the link below for full details. July 28, 2014 : Member launch of the GTEN Forum, a free online community resource! We are thrilled to announce the soft launch of the GTEN Forum, our newest online resource! 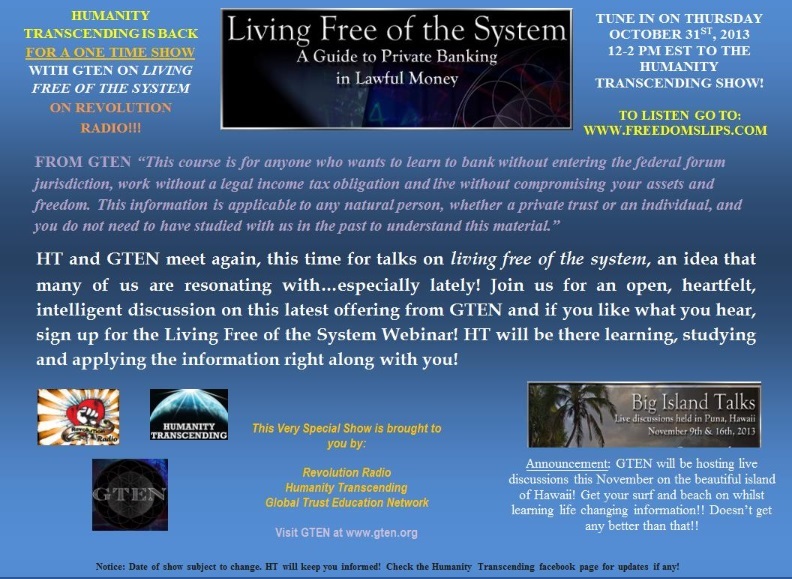 The GTEN Forum is a free meeting place to discuss a wide range of topics related to consciousness, natural law, the organic laws, rights, freedom, sovereignty, commerce, contracts, trusts, asset protection, conscious creation, healthy living and the like. It features both public and private discussion forums in a robust, searchable format that will form a large knowledge base and a valuable resource for an enlightened community. 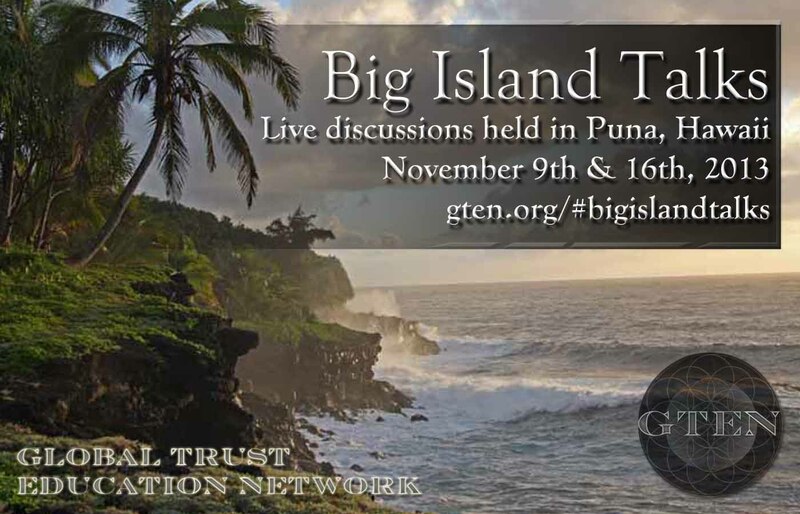 Visit GTEN.org/forum and interact with knowledgeable trustees of private trusts, savvy practitioners of freedom, and conscious creators of meaningful change for a world that works for all life. There's no cost to use the GTEN Forum. Come ask questions, post your knowledge, meet others who share your understandings and be a part of the Global Trust Education Network online community at GTEN.org/forum! We have a special guest for you tomorrow evening, Eric, a most valued member of the GTEN network. Together we will engage in a comprehensive breakdown of the subjects of lawful money and the income tax as intended by the Organic Laws and Congress and as interpreted through the eyes of the Supreme Court. Each member will learn whether or not the income tax is constitutional, how it works and whether or not it rightly applies to you. As always, tomorrow night's session will be video recorded for those with scheduling conflicts. May the language and voice of the new year create new possibilities and new wonder. The stories of the past and stories of the future are just that--story. By living in the present we find truth. Thank you for your support and engagement. All the best to you and yours in the new year. Tune in for a GTEN trustees PJ and Christian on the Humanity Transcending show on Revolution Radio tomorrow, Thursday Oct 31, 9am PT, 12pm-2pm EST. We'll be discussing Living Free of the System, our upcoming webinar series. Enrollment in GTEN's Right to Travel webinar has yielded much clarity for me. Bringing case law and code side by side for comparison allows me to see for myself the stark distinctions between a right and a privilege, between the words and terms of the code versus the words and terms of rights. This comprehensive, finely detailed and inspiring webinar is just part of an exquisite ongoing series of educational offerings from Global Trust Education Network. Other webinar series' include the Private Trust Education, Trust Web Structures, Living Free of the System and Exempt Organizations. The next GTEN webinar series, Trust Web Structures, originally scheduled to begin July 10, 2013, has been rescheduled to start Wednesday July 17, 2013 at 5pm PT, 8pm ET. Please forgive us for the slight delay. As some may know, we are presently assisting one of our members in brushing back the encroaching police state by means of a federal law suit against certain law enforcement officers and county officials for violations of constitutionally protected rights. It turns out our original start date for Trust Web Structures is now also a critical court date in that federal case, so we've postponed the webinar series one week. Meanwhile, please check the Trust Web Structures section of the Member Portal for the homework for the first webinar and save the date, July 17. See you then! June 19, 2013: New Member Special Offer Announced! Check out our Special Offers. In there you will find a new offer we've put together just for our many new members. The New Member Special Offer gives you the opportunity to experience our upcoming live webinar Trust Web Structures for free if you register for Private Trust Education. We believe strongly that the Private Trust Education Series is the best place to start if you're new to GTEN.org. With Private Trust Education you will gain a comprehensive understanding of how to set up and operate a private express trust, with the trust indenture and all the needed documents provided. Then with Trust Web Structures you'll gain the understanding of how to operate from that private position out into the public. Exempt Organizations has wrapped. Thank you to all who participated in that webinar series. Our next webinar series, Trust Web Structures begins July 10. April 1, 2013 : GTEN announces Project Pay-It-Forward! When you donate to GTEN for one or more of our offerings, your registration is free, and your donation pays it forward for a new member of your choosing to join us in the same offering along with you. Just send us an email within 2 days of donating that gives us the name, email address, city and state of your chosen additional member, as well as the offering you registered for, and we will send a welcome email to the new member showing his or her membership and registration as a gift from you and providing login, password and details for GTEN.org. We want to set an example of giving. With Project Pay-It-Forward, we give you your membership and registration for free whenever you give membership and registration to someone else. You can't buy anything. You can't even donate for yourself. But when you give for someone else, you get it for free. Your invited new member must be a NEW member. That is, it must be an individual who has never been a member of GTEN.org. The idea is to expand the knowledge into the global community on a pay-it-forward basis. We trust this will inspire and encourage you to give in all ways in your life. Our intention from the beginning has been to give more than we receive. We feel blessed to be able to offer Project Pay-It-Forward for everything we do from now on. Please help us continue our mission. Donate $10, $20, $40 or more here. Thank you!